Three views over time of the coronal mass ejection (CME) released by the sun on Feb. 9, 2013 as seen by the Solar and Heliospheric Observatory (SOHO). A long-lasting solar flare erupted from the sun early Saturday (Feb. 9), triggering an intense sun eruption aimed squarely at Earth. The solar storm, however, should not endanger satellites or astronauts in space, but could amplify auroras on Earth, NASA says. The solar eruption —called a coronal mass ejection —occurred at 2:30 a.m. EST (0730 GMT) on Saturday during a minor, but long-duration, flare. It hurled a wave of charged particles at Earth at speeds of about 1.8 million miles per hour (nearly 2.9 million km/h). The sun eruption was captured in photos by the Solar and Heliospheric Observatory (SOHO), a joint mission by NASA and the European Space Agency. 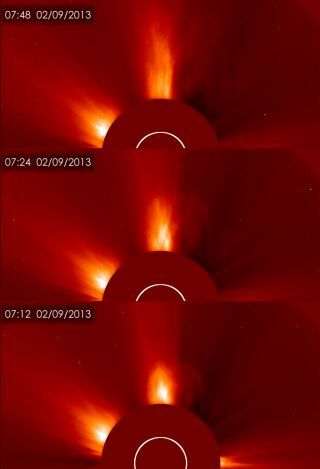 Coronal mass ejections, or CMEs, are eruptions of charged solar material that fling solar particles out into space. When aimed at Earth, they can reach the planet between one and three days later, and cause geomagnetic storms when they interact with the planet's magnetic field. They can also amplify the northern and southern lights displays over the Earth's poles. "In the past, CMEs at this strength have had little effect," NASA officials said in a statement. "They may cause auroras near the poles but are unlikely to disrupt electrical systems on Earth or interfere with GPS or satellite-based communications systems." "We live right next to a star," wrote Canadian astronaut Chris Hadfield, who currently lives on the International Space Station, in a Twitter post. "Today it ejected a huge blob at 500 mi/sec. But not to worry - should be good aurorae." The sun is currently in an active period of its 11-year solar weather cycle, and is expected to reach its peak this year. The sun's current weather cycle is known as Solar Cycle 24. The SOHO spacecraft and several other sun-watching observatories, such as NASA's twin Stereo spacecraft and the Solar Dynamics Observatory, constantly monitor the star for changes in solar weather. Editor's note: If you snap an amazing photo northern lights photo or any other night sky object, that you'd like to share for a possible story or image gallery, send photos, comments and your name and location to managing editor Tariq Malik at spacephotos@space.com.